One of the crown jewels of Northern Nevada ultrarunning, put on by the Silver State Striders. 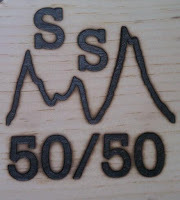 I've only ever run the half marathon, but someday am going to get it together and step up to the 50K or the 50 miler. What ever distance, it's a great course and a well-organized, class act. See pics from past years here. Still don't know too much about this one - a 5K in Virginia City benefiting Global Voice, a local volunteer group. Some cool looking races in the info that was provided in the goodie bags from the 50/50, though - both coming up in August. Saturday 8/10 is the Genoa Peak MAD-athon, a marathon or half in the hills above Genoa. That's put on by the people who did the Winter Trail Series down in Carson City, who know how to mark a tough course. The next weekend, Sunday the 18th, is the Reno 10 Miler, from the Race178 team who do the Odyssey. Course isn't posted yet, but it can be run individually or as a 3 person relay. Check them out!